I picked this top up from a Charity Store for $3. 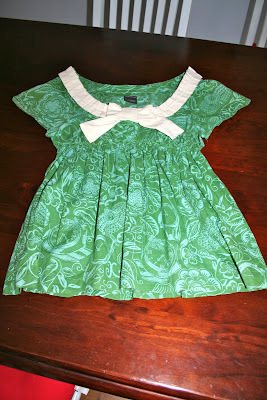 I loved the green fabric and the cut of the top ... but it need my special creative touch! Again I have forgotten to take a before photo until I had pinned half the pleats on (which I wasn't undoing). so you get the idea. It was a very plain top. I added a pleated ruffle around the entire neckline, and a big bow, in a calico fabric which gave it some weight on an otherwise lightweight cotton top.